Download your FREE Storyspace demo now! 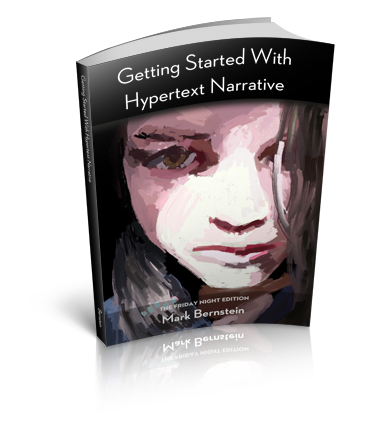 Ebook edition of Mark Bernstein’s Getting Started With Hypertext Narrative. The paperback edition of Mark Bernstein’s Getting Started With Hypertext Narrative. Bound galleys: very limited supply. Keep in touch with Storyspace! Moderated, concise, and timely; we never share your email address. HyperCafe, an award-winning interactive film, places the viewer inside a virtual cafe. It's a strangely real yet cinematic experience, a video environment where stories unfold around the viewer. Select a conversation, and the navigation pan fades into a closeup, two men talking, and one's saying to the other, "in fact, our words over here don't affect their words over there." Written, directed, and produced by the team of Nitin Sawhney, David Balcom, and Ian Smith, a report on HyperCafe won the prestigious Engelbart award at Hypertext 96. A fuller discussion of HyperCafe has just appeared in the IEEE Multimedia Journal, and the work itself has been featured at conferences and festivals throughout the U.S. and Europe. A screen shot of the HyperCafe shooting script, in Storyspace. Copyright 1996 by Nitin Sawhney, David Balcom, and Ian Smith, used by permission. The key to HyperCafe's success in melding art, cinema, and interactivity -- and the reason it succeeds where so many high-budget cinematic games have foundered -- is the complexity of its interactive linking. Linking devices that the creators call "spatio-temporal opportunities" build connections between scenes, and cleverly-filmed sequences provide navigational bridges to connect threads. Rather than simply stringing together isolated cut-scenes, the HyperCafe team has thoughtfully interwoven options that let the viewer interact without interrupting; the viewer participates but does not dominate. The conceptualization (planning) phase requires the author to consider the overall (large-scale) structure of the video. The use of a hypertext authoring tool such as Storyspace can be of substantial value at this point during the construction of the video spaces ....The result of this phase is a hyperscript which should embody sufficient detail about the video scenes, narrative sequences, and opportunities to produce a shooting script. Storyspace, with its emphasis on links and structure, and its low production values, seems an unlikely tool to play a major role in creating a cinematic experience such as HyperCafe. Indeed, the HyperCafe team used many tools in production, including Director and a custom-written Hypervideo Engine . Nonetheless, the HyperCafe team recalls that "A primary influence for hypervideo originated in the hypertextual framework of Storyspace. Users create 'writing spaces' or containers for text and images, which they link to other writing spaces. The writing spaces form a hierarchical structure, which users can manipulate and reorganize." 1. Nitin "Nick" Sawhney, David Balcom, and Ian Smith, "HyperFace: Narrative and Aesthetic Properties of Hypervideo", Hypertext '96 Proceedings , ACM, New York. pp. 1-10. 2. Nitin Sawhney, David Balcom, and Ian Smith, "Authoring and Navigating Video in Space and Time", IEEE Multimedia Journal , Fall 1997. © Copyright 2019 by Eastgate Systems, Inc. All Rights Reserved.